There may not ever be a perfect time to shop for a newer vehicle. However, when you shop with Carson Cars and look for used Jeeps for sale in Shoreline, you are going to see that anytime is the perfect time. Working with a reputable used car dealership can go a long way towards making sure that you are able to have a wonderful buying experience from start to finish. Whether you are a first time car buyer, you are hoping to add a Jeep as a second vehicle, you are looking for a discount due to being a military veteran or you have poor credit and are worried about your credit score, Carson Cars will be able to help! Think about it. Picture yourself behind the wheel of the Jeep of your dreams and taking on any of your road trips or adventures that you have planned out. The Jeep brand name is well known for quality and performance, so it is only a matter of picking out the style that you love and getting a wonderful price. There are always at least 200 vehicles available for sale on the lot at Carson Cars, with a good portion of them being the Jeep vehicles that you are hoping to browse through. Stop by the dealership today, talk with the knowledgeable sales staff and learn about all of your options when it comes to a great deal on a car loan. The in-house finance department will be happy to sit down with you to crunch the numbers and will make sure that you are able to drive away happy in the Jeep you have been dreaming about. 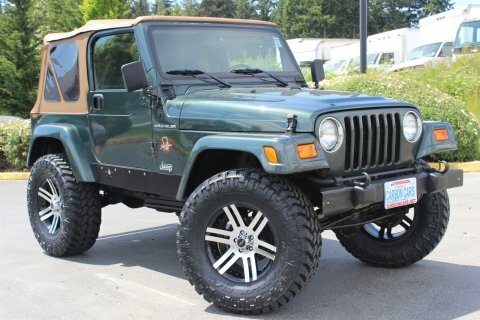 If you are looking into low rates on used Jeeps for sale in Shoreline, call Carson Cars at (855)583-9356 for great deals, inventory and customer service.